DOU was the first restaurant I bumped into in Milan, while I was visiting a flat nearby and it has remained one of my favorites in the city ever since. 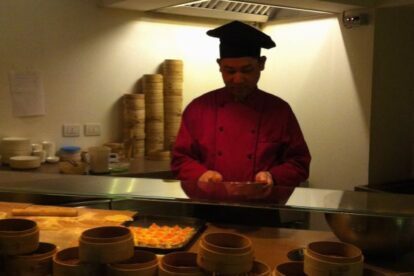 At the entrance, you will see a guy (Xoing aka Antonio) preparing countless variety of dim sums. It seems that he puts all his care into those stuffed dumplings that are waiting to be steamed or grilled. And I can tell you that once you taste one of his dim sums, you would feel like giving a handshake to the guy out of respect for how good they are. You have all kinds of options but my favorites are the ones stuffed with grilled pork meat. If dim sum is not really your thing, they have an extensive menu with dishes, they are all simply delicious. One of the greatest draws of the place is the selection of cuisines from different regions – Thailand, Indonesia, South China, Malaysia, etc. The design is minimalistic – dimmed lighting with spot lights on each table, so the feel is very intimate. It is a weirdly great combination between chic and relaxed atmosphere. Downstairs there is a bar area but I would recommend you go for dinner or, if your timing allows, go for the very good value-for-money lunch deals. On your way out, look at the large photo hanging above the cashier. Try to guess which location it is from. A hint – it looks like New York but it isn’t.